Food trends come and go but great Chinese food is forever. Whether you're looking for plump dumplings, tasty Peking duck pancakes, glistening BBQ Pork or crispy salt and pepper squid—we got you. These are the best Chinese restaurants in Sydney, so team, assemble the crew and dust off your stretchiest of pants. You’ve got feasting to do. From Sydney institution, Golden Century comes their newest venture The Century at The Star. Serving up all the classics and signature dishes, the menu is brimming with fresh seafood, including live lobster, abalone, king and mud crab. There's also plenty of poultry and vegetarian options available. This Kensington establishment showcases cuisine from Chairman Mao's native Hunan province in China, and the menu is a mix of cold, steamed and classical Hunan dishes. Here it's all about quality ingredients, executed with skill and finesse and served up in style. Must-try dishes include the red-braised pork and stir-fried smoked pork with five-spice tofu. At this CBD dumpling house, modern and traditional flavours collide, with a menu that spans cold cuts, hearty soups and Chinese-style tapas. Handmade noodles take centre stage, but there's also a selection of unique creations such as: Macanese mini burgers; handmade egg and spinach tofu; and beef and jumbo prawn dumplings. Famed for the best xiao long bao (pork dumplings) in the city, Taipei-based global chain Din Tai Fung has become a household name in Sydney's dining scene. Skilled dumpling experts create firm and delicious parcels of goodness, which attract a queue for lunch and dinner at its four outposts: World Square, Chippendale, Westfield Sydney, and North Sydney. If you enjoy your Chinese cuisine traditional and damn tasty, then this Sydney stalwart is your go-to. Open until the early hours of the morning, this is the best late-night fare in town. Enjoy incredible Peking duck, san choy bow, crispy skin chicken, Mongolian lamb, braised beef and black bean, sweet and sour pork—the classics done best. Yang’s Dumplings is a Shanghainese dumpling Mecca in Burwood, known for making all of their delicious little parcels of joy from scratch. 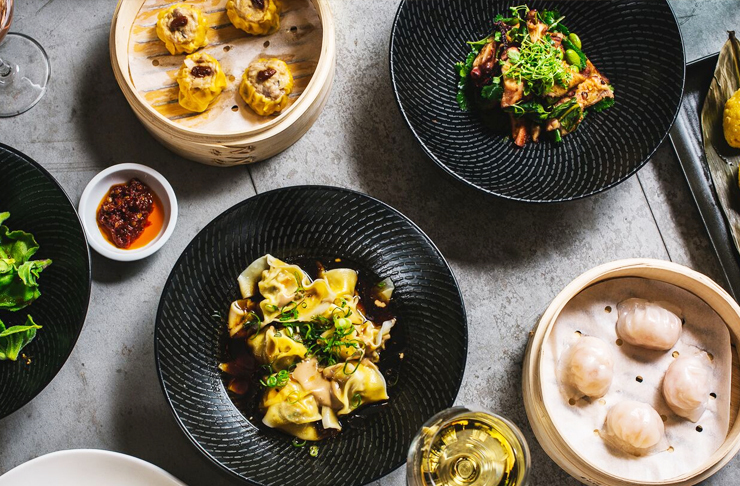 This is their second Sydney outpost and unlike the first, they’re serving more than just sheng jian bao and xiao long bao. The menu here also features other dumpling favourites, like pan-fried dumplings (guo tie) and wontons, but our hot tip is to add all of the chilli oil and peanut sauce to everything you order. After a few years on the Sydney food market scene, Belly Bao has opened a standalone store smack bang in the centre of King Street. We just love sinking our teeth into any form of Asian street food in Sydney, especially when it comes in the form of an impossibly soft bun filled with crispy pork belly, or a plate of perfectly sticky chicken wings. The other reason to head on down to the team at Belly Bao is for their epic dessert baos. Golden Gaytime fun anyone? Thought so. With rich red carpets and dark features, it’s like you’ve stepped into the scene of an old Chinese film where the old mob do their illegal tradings. But at Spice Temple, the only illegal tradings that’ll be made are the ones you make with your dining partner to score that extra piece of three shot chicken or Guangxi pork belly. Neil Perry caters for all with a range of dishes, flavours and level of spiciness to suit everyone, from fish drowned in heaven facing chillies and handmade egg noodles with XO. Be sure to pick up a cocktail named after your zodiac sign too! Lees Fortuna Court is a North Shore institution famous for its delicious and fresh Chinese cuisine, most importantly, it is all presented upon the traditional Lazy Susan. A testament to the tasty, tasty fare this expansive restaurant is packed out every night of the week. 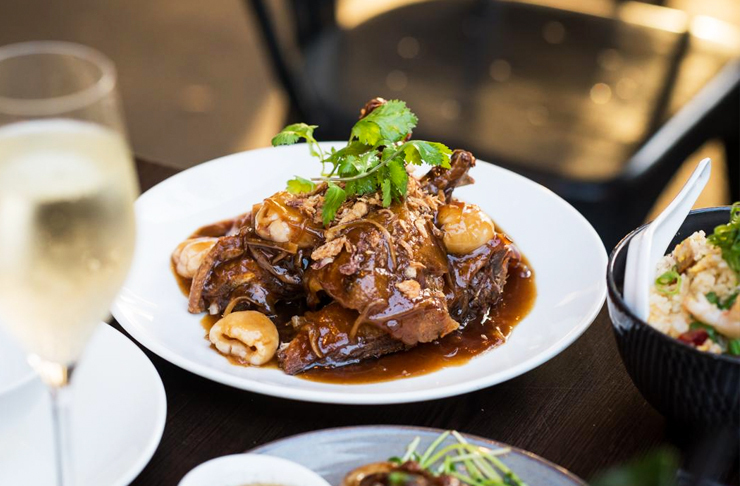 Serving up modern Chinese cuisine for over three decades, go for the 10-course banquet menu, which features specialities like lamb pancakes, salt and pepper king prawns and shan tung chicken. From the China Doll folk, China Lane offers a clever, modern take on traditional Chinese flavours. There's a 1960s-Shanghai vibe here, decked out with lounges, miniature TV screens, and a cloud of empty birdcages. Go for the Wagyu beef massaman, duck pancakes and the pulled pork on steamed bao. A tribute to Cantonese eating houses, Mr. Wong's menu spans more than 60 dishes with highlights like roasted honey glazed Char Sui pork; Kung Pao chicken; and crispy fried Balmain Bugs. There's a flash fit-out, fine cocktails, and Dan Hong rattling the pots and pans—so you know it's got to be good! Dumplings are good. But dumplings served with cocktails are even better (let’s be real), which is why Fei Jai Next Door is putting Cantonese cuisine on the map. Located in Potts Point, this little spot is ideal for letting the good times (spring) roll. Fei Jai, which literally means fat boy in Cantonese, offers a well thought out oriental menu. If you’re after something small, head straight for the Fatboy chicken steamed bun, served with chilli mayo, pickled daikon and carrot. If you want to go all in, then ask for the Old school crispy sweet and sour red vinegar pork with lychee—and yes, it’s designed for sharing, but we won’t judge if you keep it all for yourself. 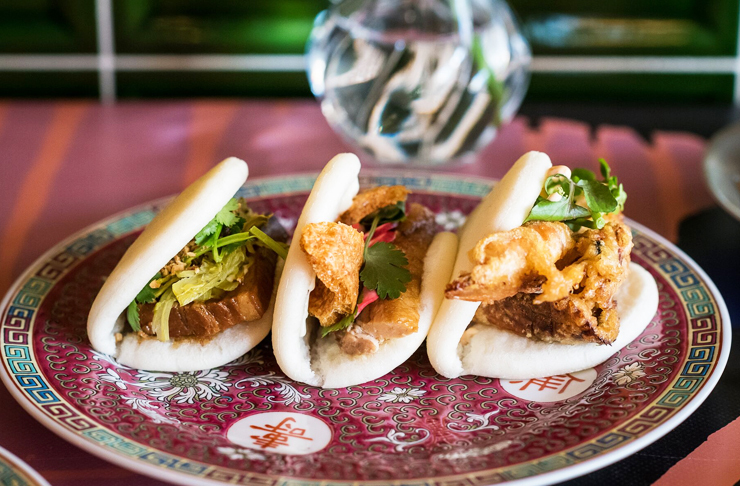 When it comes to delicious Chinese street food Madame Shanghai is your new go-to. Serving up a simple yet much-loved selection of yum cha faves, the focus here is on the charcoal grill. Our must-orders are the tangy chargrilled king prawns with coriander, chilli and lemon, and the Shanghai red braised pork belly in a dark soy sauce. Go on, order both. This ode to authentic Chinese fare will have you gobbling up more sizzling, sweet, sour and spice than you thought humanly possible. Offering all the loveable elements of a trip to Chinatown without the dreaded cues and plastic cutlery, eating your way through this ridiculously long menu will cost you little more than your dignity and waistband. Be sure to try the sizzling Mongolian lamb, the eggplant in Grandma’s secret sauce and the corn dumplings—you can thank us later. The Noodle House has been a Haymarket institution for years, best known for their generous servings of handmade Xinjiang noodles and ‘grapes on the roof’. If you’ve been, then you know exactly what we’re talking about. Well, you can now get your mouth around a curated ‘best of’ menu at their newest spot in Newtown. Dubbed the Dumping Master, it’s not hard to guess what you’ll be ordering here. Feast on pan-fried, steamed or boiled dumplings filled with pork, chicken and chives, and eggplant until your heart (and stomach) is content. ICMYI the name of this one says it all. From the outside, Yummy Seafood Chinese Restaurant may appear ordinary but one glance at the menu and it’s obvious it’s anything but. Order allll of the seafood or opt for something a little less seafood-y (that’s a word, right?) like the green beans with pork mince and XO sauce or the black pepper beef. Neither will disappoint. Regardless of the occasion (or time of day) Eaton Restaurant has long been a firm fave for hearty servings and tasty Cantonese flavours. While it’s facade is understated, the menu packs a serious punch that’ll have you coming back next week. Whether you head here for lunch, dinner or a late night feast, the Hong Kong style mud crab with chilli sauce and the XO pipi with vermicelli noodles are always a good idea. TBH, we’d head here for the complimentary chilli pickled cabbage alone, it's that good. Sydney’s harbour-side dining scene got lucky the day Lotus Dining moved into Barangaroo. The waterfront restaurant is complete with live fish tanks with lobsters and crabs, a curated herb garden, and an eight-seat dumpling kitchen serving a whole new range of delicious dumpling delights. Expect to find all the modern Chinese favourites as well as new Shanghainese-inspired dishes. Picture a seafood heavy menu with a touch of Australiana and you’ll come close. When it comes to next level yum cha and Cantonese everything, let’s just say The Dynasty has it mastered. If you think the traditional Chinese style pagoda roof, serene bamboo plants and collection of Chinese artwork are authentic, wait until you try the juicy Peking Duck, spicy seafood hot pot and eggplant and pork in Szechuan sauce. Let the feasting begin. Spicy Sichuan Restaurant is popping up all over Sydney, so you won’t have to travel far to get your fill of delish Chinese-style meats, seafood and soup with a side of spice. Okay, who are we kidding? The spice is the main event. In the mood for laid back vibes and epic Sichuan eats? Then say hello to Sichuan Impressions. Past the modest shop front, you’ll find a bustling restaurant with the heady flavours of spice and we know that’s the reason you’re here. Do yourself a favour and order the kung pao chicken for a mouth-tingling hit of chilli. best washed down with plenty of ice cold beer (it’s BYO so go HAM). Serving a fusion of Uyghur and Chinese flavours, Tarim Uyghur Restaurant offers a unique take on your standard Chinese restaurant that’ll have you travelling to Auburn on the reg. The menu combines delicious staples like juicy pieces of seared lamb in a spicy Mongolian sauce, topped with shallots and also house specialities like the toho qordah. The latter involves spicy wok-tossed chicken pieces in a house made chilli sauce, but there is also a range of share plates and vegetarian options, so even your fussiest mate will be satisfied. If you’re heading to Lao Hui Min then we have one hot (and very important) tip for you: bring your biggest appetite. The handmade noodles and rich beefy broths are a must, as is bringing a crowd—you’ll need it to tackle the monstrous dishes by Chef Bill Mas. Challenge accepted. It’s not often that you can dive head first into your dinner (literally) without attracting looks from other diners but at Hong Fu, that’s half the fun. Here, you're encouraged to leave your dignity at the door, pull on your rubber glove (provided) and feast until you’re bursting. Order mountains of handmade noodles, crispy pancakes and piping hot mounds of tender kebabs, then ditch the cutlery and (like we said) dive right in. With various locations around Sydney's CBD, you’ve got no excuse to get down to Two Sticks for their signature crossing-the-bridge noodles. These bad boys involve deep bowls of piping hot broth jam packed with handmade noodles, served with a side of fresh vegetables and lightly cooked meats. So load up your bowl with all the sides and start slurping. For something lighter, order the fresh glass noodle salads. We could never leave Sydney’s Queen of Asian cuisine, Kylie Kwong off the list. Her restaurant, Billy Kwong, is a must for finer Asian dining with its organic and biodynamic ingredients, and a fine balance between East meets West. Be sure to try the stir-fried snow peas with asparagus, ginger and zucchini flowers, and the red-braised caramelised wallaby tail with black bean and chilli. The lantern still shines bright at Billy Kwong. Want more Asian eats? Here are 50 things you need to try in Sydney. Swapping the sunny shores of WA for two years eating her way through Europe, Bec's love for Italian food is slightly ridic. Rivalled only by her affection for gelato—she's happiest when eating ice-cream, and when she's not sampling Messina's newest flavour Bec can be found trawling for vintage market finds and grooving to live music, rosé in hand (obvs).